Due to popular demand (Hi Adrian!) 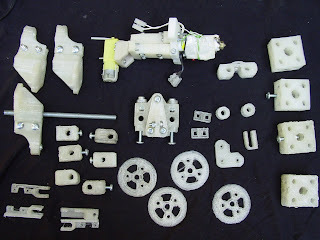 here is another snapshot of the parts fabricated so far, including the extruder made on Zaphod. You may note a few other additions - opto brackets, bed corners and XY idlers - have joined in. I've been eating up the filament from Imagin Plastics in Henderson like it was spaghetti, and may well have to go back there cap in hand. 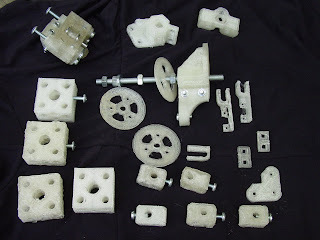 I do have enough to finish fabricating this RepRap and to feed it well enough to make the next generation. 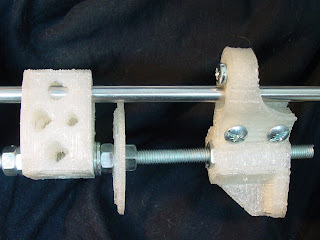 CAPA supplies are coming soon, so I might have a go with CAPA extrusion again later. See you in just over a week! I've taken the cutting board off the RepRap and given it a damn good sanding flat, checking it with a steel ruler like my old Design & Technology teacher showed me while I was busy wrecking his workshop. Adhesion improved, particularly for large areas. Not managed to print an X Motor Bracket properly yet. The Y Bearing Housing I printed the other day broke when I put the insert in. 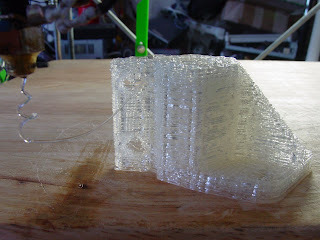 I found that there is an area inside that gets no infill, and so the part is really fragile. I narrowed it down to a pretty damn minimalist debuggable shape and sent it to Adrian, the internationally famous geometry guru. A mere 8 points or 12 triangles. Brain currently fried due to insomnia, my back is aching like hell through painkillers, and LinuxConf is less than a week away. Ohboy. 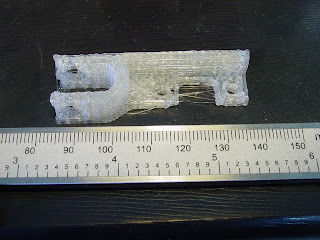 Ed tells me that my Darwin is now extruding at half the speed of the Stratasys FDM machine - albeit at a lower quality. Once I've replicated my combined output will be approximately the same as said machine with significantly less outlay. So, if you're wondering how many RepRap bits I've actually made from PLA, and hence how far off replication we are, have a look at the picture. There's a variety of different versions of software in use, with the old ones looking distinctly lumpy, but the parts are functional. 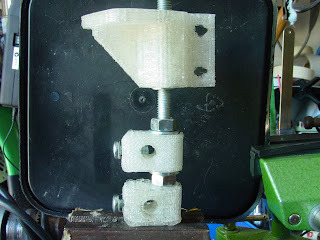 Following in Ed's footsteps, I've run off a copy of the opto bracket in PLA. The build time was 51 minutes, extruding at just under 140C. Looks good from here. Just finished a Corner Bracket, Bed Constraint Bracket and its insert. I've stuck them all on the same rod, and the centre of the insert does line up with the corner bracket's hole. Bolts are now sliding in without having to attack things with a power drill. Missing from the collection is the Z studding tie, which gives our software a little trouble - Adrian is working on it. Meanwhile I'm extruding Darwin parts with my PLA extruder on Darwin at just over 4cc/hr. And just for Ed, another close-up shot of that corner bracket. It's good to see quite a tight distribution of trends here, as high filament temp eases the load on the extruder, however, it's worth bearing in mind Vik's previous comment: "Be wary of running over 100C. If your plastic has absorbed moisture, you may get steam bubbles. If they're small, no problem. If large, they interrupt the feed of fine extrusions." My best lessons so far have been getting the temp relatively high, ~130°C (to reduce extrudate viscosity and prevent extruder stalling), and to spend time getting the layer increments spot on (to guarantee layer bonding). I'll upload my variables today into the 'tweaking' section of the wiki. Here's the Bed Corner mounted up with springs & nuts on a piece of studding. On the bottom of the studding I've stuck 2 Diagonal Tie Brackets. The top one - from Steve's no-overhang STL - is printed using the new software and has not been manually tidied (though I did have to warm up the retaining nut to get it in), the bottom one was done with last month's software and has been tidied. Adrian's latest fixes have made quite an improvement in quality, I'm sure you'll all agree. Sadly, printing Corner Brackets in fine detail seems to cause a new bug so no more of them for a little while. But I'm off to Wellington in a few days anyway, and I'll be taking Darwin with me. It took me 3 goes. One cable pulled, and a stuck filament roll; but I got it printed in the end. Thanks to Steve for helping with the STL file. 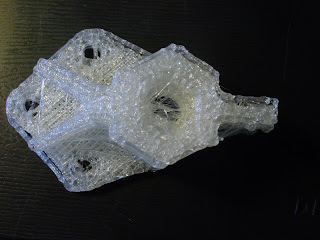 The object took 5.8 hours to print in PLA using Darwin hardware and Adrian's latest fixes. It has really picked up steam now and the quality has improved as the nozzle moves faster - as predicted. No hint of curling on this part either. If you look inside the holes on the left, you can see some stringing, but it is now more like annoying cobwebs than a barrier that needs drilling out with a cordless drill. Just as well - I did stick an 8mm drill bit in my hand last time. Here's the view from above, with a clearer view of the stringing. The thick stuff is caused by a plotting error we're looking into, and the fine, spider-web stuff is what the more persistent stringing issue now looks like. I've tried to bend the part, and it doesn't break despite the plastic flow being a little low, so we should be good to give it a go in a real Darwin. Yay! I finally got non-sick, non-busy, and non-not-in-New-York and got a few hours to sit down mano-a-arduino and finished the RepRap protocol integration. The hardest part and biggest challenge was implementing the Celsius -> PIC temperature reading (as well as PIC temperature reading -> Celsius). Thanks to Steve DeGroof, I was able to plug some values in for an 'ideal' thermistor and everything worked like a charm. The PIC emulation is accurate within a couple degrees at the high end (250C) and within a few tenths on the low end (room temp). What this all means is that the Arduino based electronics are now 100% compatible with the current host software. For all those who are using the Arduino based electronics, its *highly* recommended that you upgrade (otherwise, they wont really work.) Here's what you gotta do. 1. download the new firmware from SourceForge. 2. copy the library files from the firmware .zip into your arduino's library directory. overwrite the old libaries if you have an older version of the RepRap Arduino firmware. 3. update the firmware and host software prefs as per the wiki. Thats it! If you have any questions, bugs, or suggestions, let them fly in the comments. I've been thinking a lot lately about the Arduino and some of the cool advanced things we could do with it. Some of it was spawned by threads in the forum about servos vs steppers and some of it was because of some problems we've been having with thermistor style temperature measurement (blown thermistors, inaccuracies at high temps, etc.) Anyway, I've been working on a couple new circuits that have the potential to be very useful. This one is a high quality temperature measurement board based on the AD595 chip. It uses a thermocouple to measure temperature, and is specifically designed to be used with Type K thermocouples. The nice thing about a thermocouple is that they can withstand *very* high temperatures. The type K thermocouple is rated for up to 1200C. Thats hot. The sensor board is really just a PCB to house the AD595, an LED, screw terminal, and the interface pins. The vast majority of the work is done by the AD595 which takes the signal from the thermocouple and converts it into an output that is ideally suited for an ADC converter. The way it works is that the AD595 outputs 10mV/C... which means that it is *very* simple to convert a reading from a thermocouple to a Celsius reading. The circuit is mostly done, but I'd love to get some feedback before I have a prototype run made. Given the small size of the board, a prototype run will still be 100+ boards. Anyone want one to play with? A rotary encoder is a circuit that allows you to precisely know the rotational position of something. In our case, we'd use it to know the exact position of our motor. This one is a high precision rotary encoder based on the Austria Microsystems AS5040. It uses a magnet on the drive shaft, and a chip that detects magnetic fields (the AS5040) to detect and tell us exactly what position it is in. The AS5040 offers 10-bit resolution (1024 positions/revolution) and offers a TON of outputs: quadrature encoding, PWM output, analog output, and a shift register style output. This board takes the AS5040 and brings all the outputs out to us so that we can use the one that matches our needs. Here is the shot of the two finished corner brackets. The furthest one has been trimmed of string, the nearest has not. They seem functional but I need more to know for sure. Note how the holes in the sides have been sealed off by stringing. This problem has since been much reduced. Here we have the start of a Corner Bracket (that died 1 min after I took the photo due to me tugging the USB lead out). Steve DeGroof kindly modified the STL file so that it will print without support material and so I decided to give it a whirl. The RepRap is running much faster following Adrian's recent changes to speed corners up, as I have been able to raise the speed in general. Two other milestones: The communications now copes if you disconnect the serial lead and reconnect it again - though not so happy if you disconnect the USB lead! Also I've now printed with over 100m of PLA filament. Adrian's new code speeds up the nozzle for short segments. This work-around massively improves previous problems caused by segment-pausing (the pause between segments was causing a noticeable extrudate dump between short segments, over a radius for example. The new fast speed option evens things up a lot). Temperature constraints for the extruder in GenericExtruder.setTemperature() have also been tightened from 10% & 20% to 3% & 6%. OK, so I have a Corner Bracket in PLA. Took about 10 hours to print. I'm trying a second one now, just to make sure it's not a fluke. I'll update with photos later. 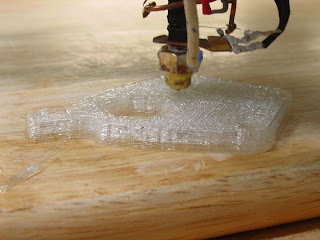 As it comes out of the RepRap, the stringing within the part obscures many of the holes, and drilling is required to make the part usable. Is this considered minor refinishing? A cordless drill with 8mm or 5mm bit basically guides itself into the right position; I just hold the PLA bracket in my hands and try not to drill my fingers. 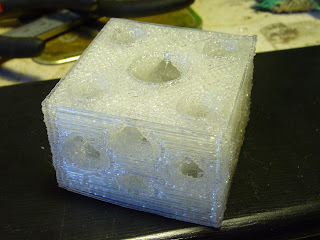 Blobs are apparent at the end of each layer, when the nozzle halts and the RepRap software figures out the next one. The nozzle oozes. The Corner Bracket has rounded corners which will not print without overhanging, and these cause knock-on wall collapses up the side of the corner bracket. It would be better if the corners were square. Mid-way up, the distance between hole and corner is quite small. This results in a rather fragile-looking corner. This would be strengthened by leaving the edges square, but an extra mm of wall thickness wouldn't hurt either. Is it strong enough? Just, I think. For the moment I'll call it good enough to try and build another Darwin with. After a week I should have a full set of Corner Brackets! I've finished two new versions of the boards for the Arduino electronics. These are incremental improvements that offer cool stuff like more blinky LEDs, minor fixes, and such. Full build pix, tester code, and everything you need to know to get started with these boards. The DC Motor Driver board will control 2 small DC motors (or you could drive a small stepper if you wanted). The PWM Driver board will control 3 channels of PWM at up to 5A each (theoretically) This is used for things like fans, heaters, etc that just need to be turned on/off. The files are released on SourceForge, the boards are for sale in the RRRF store, and everything should be fully documented. If there are any questions, please let me know in the commends! 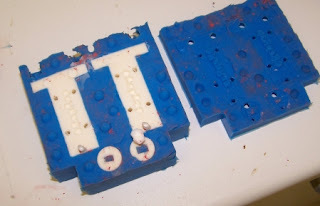 Here's a quick video of Kate and I testing our copy of Adrian's Paste Extruder prototype. We've loaded it up with 50ml water and excessive pumping. Adrian has also made some beta firmware that we hope to get out there soon, using the PIC16F648A CPU. I've stuck it in my Darwin and seem to be able to make things extrude. Darwin now has a snug carry-case, and I hope to test it out on a trip to Wellington in the near future. Congratulations to Toby Borland who has recently had his wooden lasercut RepRap machine featured at the UK Science Museum. From what I gather, Toby works for SMARTlab and is doing some really cool things. 2. To stop anyone patenting it if it is. 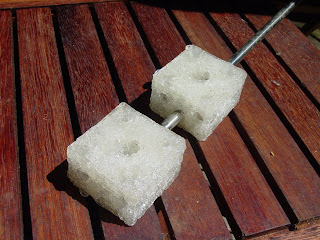 Suppose, instead of pouring in resin, you put a loop of wire in the cavity, flowed an electrolyte through the mould, switched on a current, and metal-plated the wire? Might it plate to fill the cavity with a metal object to match the cavity's shape, with the rate of deposition slowing as the growing surface approached the silicone where there would thus be slower flow?